Gallium Arsenide competes with Silicon for many commericial grade electronics and solar applications. But at nearly 1,000 times greater expensive than silicon (comparing 200mm diameters). GaAs wafers have taken a back seat to Silicon. But researchers are devising new methods to bring the costs down. Our GaAs are VGF Grown. VGF advantages include its scalability, low stress, high mechanical strength, and a defect rate that is orders of magnitude lower than conventional compound semiconductor crystal growth processes. Compared to less expensive Silicon, Gallium Arsenide superior properties include its higher saturated electron velocity and higher electron mobility. GaAs's higher electron mobility allows GaAs transistors to function at frequencies in excess of 250 GHz. GaAs devices rarely overheat due to its wider energy bandgap. 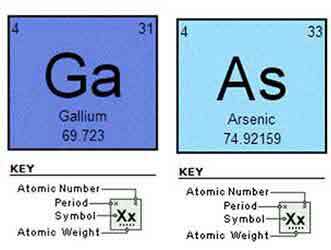 GaAs also tends to create less noise in electronic circuits than silicon devices, especially at high frequencies. This is a result of higher carrier mobilities and lower resistive device parasitics. These superior properties are compelling reasons to use GaAs circuitry in mobile phones, satellite communications, microwave point-to-point links and higher frequency radar systems. It is also used in the manufacture of Gunn diodes for the generation of microwaves.